We are now home. The journey from Hololulu by Hawaiian Airlines was fantastic. The 10 hour flight was full of watching movies on the entertainment system. We cannot speak highly enough of the Hawaiian Airlines cabin crew and the airlines per se. The two attendants that served us throughout the flight were professional and best we have experienced. The aircraft left about 30 minutes late but arrived on time in Sydney. It was uncharacteristic of Sydney International Airport to be empty. We zipped through Immigration and Customs within ten minutes. Our four bags were at the carousel when we arrived and then we walked into the winter cold Sydney night. We were home by 9:30pm. The above photograph is our last view of Hawaii. 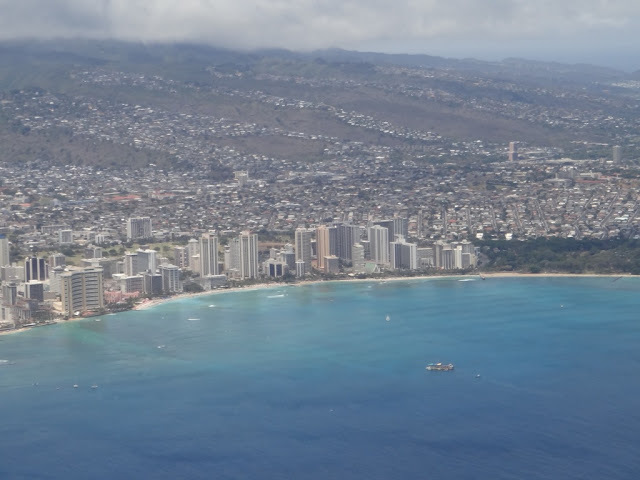 The view is Waikiki and was only three hours prior that we were on that beach. That's it for our holiday and this blogsite is now officially closed for posts. Until our next holiday. Mahalo (thank you in Hawaiian).